The Cornwall and West Devon Mining Landscape was transformed in the 18th and 19th century by industrialised copper and tin mining. Steam technology was pioneered here. The remaining landscape is dotted with waste and spoil heaps and ruined mines, railways, canals and engine houses. Also, migrating Cornish miners have had influence on mines all over the world, leading to the survival of Cornish engine houses in Spain, Mexico, South Africa and Australia. The Cornwall and West Devon Mining Landscape is one of the more remote sites on the UK mainland. The closest international airport I could fly into was Bristol, still a 2 hour and 45 minute drive away from my first destination. The WHS is spread out over 10 locations, most even much further at the tip of Cornwall and totally out of reach for my weekend trip. Together they form a partly relict and partly evolving cultural landscape, the result of 18th and early 19th century copper and tin mining. I had been advised to start at St. Agnes Mining District. 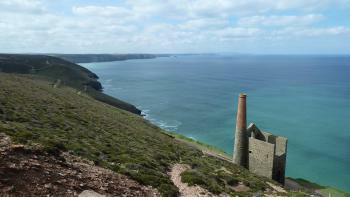 St. Agnes is a coastal village with a mining history since prehistoric times. I had brought with me a print of a 9km circular walk along the coast, taking in some of the mining ruins. After parking the rental car in the town center, I started walking immediately. Signage isn't great, but somehow I found my way to the Trevaunance Cove. From here copper ore was shipped to Wales for smelting, and coal and other goods were unloaded for use at the mines. Already on this first stretch I saw a couple of the characteristic chimneys from the former mines. It's a very pretty landscape. After my lunch at the Driftwood Spars (a former warehouse), I started hiking the full loop along the coast. There were numerous people about, often walking their dogs or just enjoying the sunny weather like I did. The leaflet I brought pointed out several points of interest on the way, but I found it difficult to trace them down. Most of the time my eyes were drawn to the carcasses of the mines - with some imagination they resemble Crusader castle ruins. In the distance you can also see the remains of waste and spoil heaps, but the landscape in general feels quite natural. I spent some 3 hours in this area, and the scenery certainly lived up to my expectations. The next morning I set out for Gwenapp Pit, a former hollow created by mining turned into an amphitheatre. It is situated way out in the countryside, only reachable by a series of typical English narrow roads and even narrower bridges. Although I found the visitor center closed, the gate to the Pit itself was open and I had a look around. It's a funny construction, used in the late 18th century for the Methodist preachings of John Wesley. Its stepped form with turf seats dates from later remodelling. My last stop was Tavistock, a town in West Devon clearly on the well-worn tourist path. The Tavistock Canal that crosssects it is a good example of the transport network that resulted from the mining in the region. The local museum only opens from Easter, like others that I encountered over the weekend. Maybe for the better, as it prevented me from making more derogatory remarks about regional British museums! So I just roamed around in town a bit. The former Iron Works now have been turned into housing. I tracked all sites of historic interest down, from the Sir Francis Drake statue to the Wharf. I ate a cheese and bacon pasty and drove on after 1.5 hours or so. I found it hard to really get a good grip on the value of this WHS, having to put the pieces of the puzzle together myself as the elements are so scattered. The nomination file is an interesting read, though it focuses mostly on the mining heydays of this region and less so on the resulting landscape. There's no doubt about the importance and global impact of these pioneering industries. The effect of mining I found much less visible than at the Nord Pais de Calais Mining Basin WHS for example, which peaked some 100 years later. The St. Agnes Mining District definitely was the most rewarding location of the 3 that I visited. 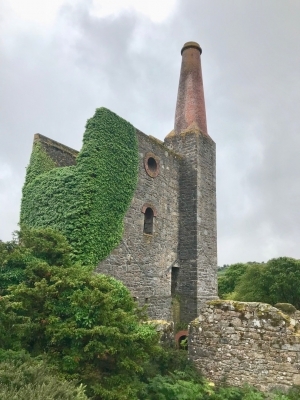 The scope of the Cornwall and West Devon Mining Landscape can seem rather daunting, with its multiple components, but after my visit last May, I felt I had a better understanding of its role in the Industrial Revolution. I appreciated the recommendations of other reviewers on this site to help focus my travels, and used the quaint town of Tavistock as a base for my two day tour. From Tavistock, which is well described already, I followed its canal south to the Victorian river port of Morwellham Quay. This open air museum includes a copper mine, a village with a large water wheel used to crush manganese, and a quay once famed for the amount of copper transiting through it. 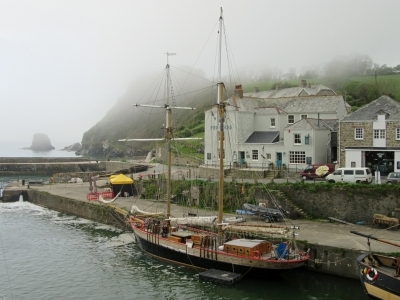 Similar to Morwellham was the atmospheric port of Charlestown, where fog was rolling in over tall ship replicas when I arrived. This coastal harbor in southern Cornwall was also used to transport the region's copper out to the world. Some of this copper ore was shipped north to the Welsh port of Swansea, which, thanks to its nearby coal reserves, became famous as a copper smelting city in the 18th and 19th centuries. One can easily enjoy touring Cornwall and Devon with no knowledge of this World Heritage Site, but I really appreciated learning about the region's mining history. Logistics: I found it easiest to visit sites via a rental car, since there are so many sites spread out across the region. In addition to Tavistock, Morwellham Quay, and Charlestown, I heartily recommend the Gwennap Pit and photogenic Wheal Coates, a former tin mine in the St Agnes Mining District. This site is hard to grasp since it is so wide spread, perhaps too wide. When I was traveling SW England this summer I wanted to see a representable part of it and decided to visit the two nearest areas: The Tamar Valley and the Cartoon Mining District. The Tamar Valley has a lot to offer: The lively town of Tavistock has evolved architectonically nicely from medival origin to its peak time in the 19th century. It has a impressive church where as often in England friendly elderly people drank and offered tea! You can walk along the quite natural river Tavi and parallel along the historically important straight Tavistock Canal. Have also a short look at the neogothic Mount Kelly College and if you like English cemeteries (as I do) there is a beautiful one right south of Dolvin Road. I can recommend the B&B The Cornish Arms, also for great Dinner and Breakfast. The nearby Tamar Valley is a lovely lush river valley, taken back by nature. 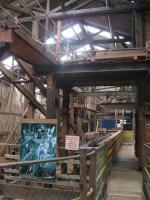 There is a the interesting and historically important industrial site of Morwellam Quay. Also in this area are the Calstock Aqueduct and the estate of Cotehele: This is the mansion of a family that was closely linked with the industrialization of the area and includes an old mill and an industrial site at the river. I felt that this combination of nearby sites gave me quite a good overview of this WHS but I wanted to see at least one of the iconic engine houses. Since the brilliantly situated engine houses in St. Agatha were quite fare we drove to the Minions, about half an hour further west. This is a good starting point for walks in all directions. We left the car at the minions shop and decided to walk NNW and it turned out to be a wonderful walk: You walk through a almost Scottish moor landscape with lots of fern, wind shaped trees, sheep and cattle (and lots of droppings everywhere!). You pass two ancient stone circles (Hurlers stone circles, a first for me) and get further north to an old quarry and to the strange, supposedly natural stone heaps called the Cheeswring. From there you can walk SE to the quite impressive ruins of the South Phoenix Mine, from there SW to the Minions heritage center and our starting point. I can only recommend this walk but I recommend to take a GPS and a internet map along. There are absolutely no signs at all and after the Cheesewring it is often a bit adventurous to find the path. The map we bought at the Minions shop was of little or no use. It is better to find the places on Google map before you go, to bring good shoes and enough time. March 2018 - Cornwall was very high on our list. Not because of the industrial heritage, but we wanted to see the beautiful gardens and rhododendrons. Afer spending the night in Exmoor NP, we continued our journey to Cornwall. We passed the City Tavistock, which apparently is part of the WHS. But we couldnt see anything really inetresting. We also passed St. Austell and the Wendron basin. Nothing out of the ordinary but surely important in history. After spending the next night at Lands End, we entered the St. Just Mining Area. That is quite impressive due to its position directly on the cliffs and the mysterious ruins. We took an 1h hike around the mines. The museums were closed that day, or at least that morning. We still had a stop at the Port of Hayle after visiting some gardens and having Cornish Cream Tea, but again, i really didnt see the OUV. My parents live in Cornwall, so I often have the opportunity to see another of the 10 subsites. To date I have visited five of them. 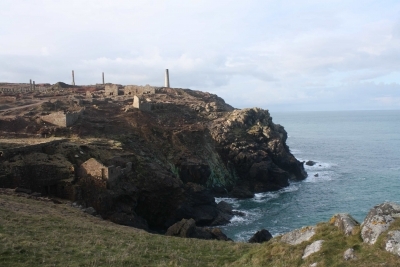 St Just Mining District - in the far west of Cornwall you will find this is one of the most photogenic parts, with derelict mineshaft pumping stations clinging to the rocky coast. I suggest heading to the Count House at Botallack and walking from there. 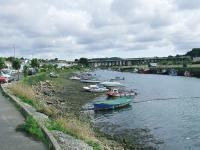 The Port of Hayle - near to St Just, much less picturesque. This was an industrial centre, and you can see the remains of a foundry and millpond. Gwennap Mining District with Devoran and Perran and Kennall Vale - a good way to see this subsite is to cycle the 11 mile miners' track. It takes you through quarry 'valleys'. Tregonning and Gwinear Mining Districts with Trewavas - a split subsite: the main part is to an area of hilly heathland with good views from the top. Several miles away is also inscribed the village of Rinsey, where - like at St Just - you will find picturesque cliffside mine buildings. Tamar Valley Mining District with Tavistock - this site is in the far east of Cornwall, where it borders Devon. Again, it is a split subsite, with one part featuring Kit Hill (very windy when I visited) and the other referring to the town of Tavistock (technically in Devon). It is a handsome mining town that was prettified by the 7th Duke of Bedford. This was the site with which I finally 'completed' my home island of Britain so obviously I was always going to be happy with it, but it formed the basis of a lovely long weekend in the 'West Country'. 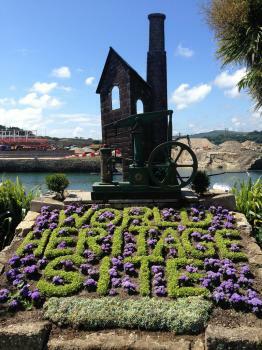 It also enabled us to discover what “World Heritage” is in Cornish “Ertach an Bys” if you were wondering. The idea of trotting around disused mines and remnant industrial wastelands may not instantly appeal; my wife wasn't necessarily so keen on the idea. But the reality of a trip can actually be very enjoyable, mostly due to the natural setting of the sites. This is best seen at the wonderful village of St Agnes. It sits above a quintessentially Cornish beach, where we sat and watched the coast guard rowers set off around the headland, before looking up at the looming chimney stacks of the former mine on the cliffs above, a more enjoyable way to spend a Saturday morning would be hard to find. 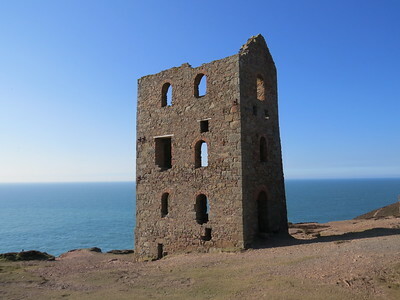 Just outside the village are the stunningly situated industrial remains of Wheal Coates which to my eye were the highlight of the WHS, not just because of the impressive vistas, but because you can also comprehend the mines stretching out under the sea below. Our weekend took us around every one of the inscribed locations, the other highlights were the unique open air auditorium of Gwennap pit, made famous by Methodist preacher John Wesley. The surrounding landscape was also frequented by the Heavyweights of the early industrial revolution in Britain, including Boulton and Watt plus local lad Richard Trevithick, his work on steam engines in Gwennap was later used to build the first ever locomotives, and also provide mining expertise in Peru and Costa Rica. The quaint port of Charlestown was also a lovely place to view the former mining infrastructure and see from where the goods and people were shipped around the world. On top of these mining relics this farthest limb of southern England provides some wonderful treats. The rugged northern coast is full of sandy coves and pleasant towns and the southern coast is home to some wonderful fishing villages, Mevagissey and Looe being highlights. Even the Cornish capital of Truro proved to be a nice surprise with a nice neo-gothic cathedral. Whilst further east the charms of Dartmoor National Park provided a wonderful way to arrive in the listed areas around Tavistock. Though perhaps it is the food and drink that is most appealing, the peninsula is unsurprisingly renowned for its seafood, but the dairy produce (especially cream) is also very impressive. Mining has even produced the food that Cornwall is most famous for, the eponymous Pasty. All this can be washed down with some fine ciders and decent ales. We had a rather enjoyable long weekend travelling all over the peninsula using the listed areas as a way of seeing the best of it. The industrial heritage is impressive, consisting of some spectacular undersea mines and the birthplace of steam driven transport. It is also interesting to discover the human and cultural legacy of the industry. However for the casual visitor it is the spectacular locations of the industrial relics around St Agnes that really made this an enjoyable site to visit. I took bus no 17 from Penzance. There are a couple of buildings one can visit and a very interesting underground tour to a mine tunnel - highly recommended. All the mines in the area were family businesses, with just 10-20 employees. The Geevor mine is about 300 years old and was just recently discovered. If you stay in Penzance, there are lots of other great places to visit in the area: St Ives, Minack theater, Scilly island, etc. Railways: "A high-quality transport network involving canals, railways and tramways connecting mines to ports was constructed in the early 19th century. This included ... tramways and railways at Poldice Plateway, Redruth & Chasewater Railway, Liskeard & Caradon Railway and the East Cornwall Mineral Railway." Silver production: "Silver-bearing ores have been worked on the Bere Ferrers or Birland peninsula, between the Tamar and Tavy rivers south of Tavistock, for nearly six centuries. By the middle of the 19th century there were at least a dozen mines, some consolidated into larger setts." Prince Charles: He "owns" various parts of this site as a result of his "position" as Duke of Cornwall. Locations include Drakewalls Mine, Prince of Wales Mine, Gunnislake Clitters Mine in the Tamar Valley Mining District. Painted by JMW Turner: Tamar Valley Mining District. "Crossing the Brook". Early Turner (1815) showing the Tamar Valley and Calstock in the style of French 17th C painter Claude but with signs of industrialisation in the valley. Sir Francis Drake: Drake was born c1544 in Tavistock within the inscribed boundary - "at Crowndale Farm, just to the west of what is now Tavistock College. A Blue Plaque is mounted on the current farmhouse, behind which Drake is believed to have been born, the original farmhouse having been dismantled and the stone transported for use in Lew Trenchard"
Golf Courses: Cape Cornwall Golf Course lies within the boundaries of St Just Mining district.